February was Kelly's month for the Twice Around the Block VQB. She asked us to make blocks using only half square triangles. No borders, no squares. I've probably mentioned before that HST give me a slight panic attack and I instantly have flashbacks to high school geometry. 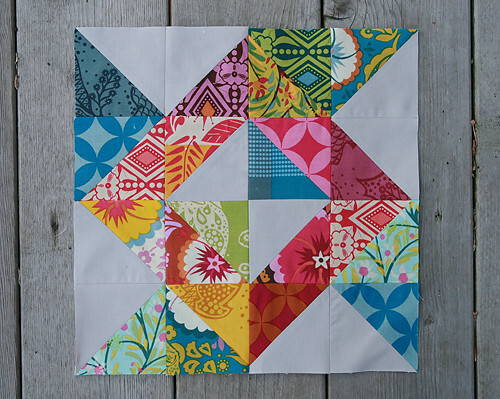 This time I decided to search online for block ideas and also purchase a HST quilting ruler. Boy did both those things make my life a lot easier! I decided to make the Blockade design. I divided the Good Folks fabric Kelly sent into warm and cool piles and jumped right in. I am very happy with how the block turned out and I hope Kelly is too!